Home / Article / How Can You Avoid the “Hidden Costs” of Buying A House? Just the Facts! 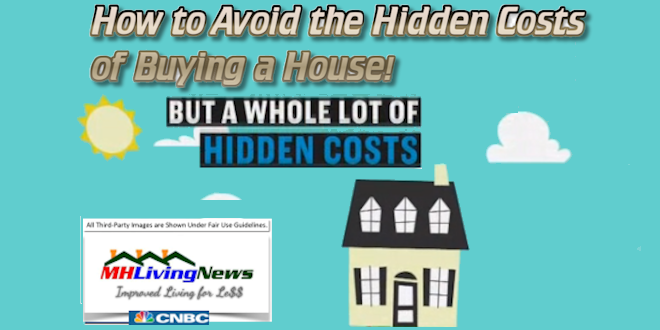 As you watch the first video from CNBC, it just begins to skim the surface of the “hidden costs” of buying an existing house. A ‘site built,’ conventional house. Want to save money now – when you buy – and later too? For those who open their mind and explore the manufactured home alternative, they discover what the couple in the video below did. They previously owned a nice conventional house in an upscale neighborhood. They had it built new, it was custom. But they still had added costs after they bought that new house. When you buy a manufactured home, the window coverings, the appliances and more are routinely included. The more you look, the more you compare, the more you’ll like the manufactured home option. The videos do a good job of highlighting the information you need to get out there to set the record straight, and they keep hammering home the message of quality, affordability and safety. The HUD official was a very nice, solid interview that also brought the cache of Credibility (with a capital C) to all of the surrounding content on the page. Likewise, the owner testimonials have the ring of truth. Once you get past the myths, what you find are powerful reasons to consider the manufactured home lifestyle.